Which database should I use? It’s a question we get asked a lot, and it’s rare we ever give the same answer. Whether a company who’s decided to invest in a new database or software product should buy an existing off-the-shelf package or have their own bespoke system developed depends on far too many things to be able to generalise. What it’s for? What data you have? How many legacy systems need to be integrated? How the data needs to be split? What features you need? How much money you have? How much time you have? How many users you have, and a host of factors besides, all impact your end decision. Looking at one of the world’s most prolific off-the-shelf systems as a great example, most users only utilise 10% of Microsoft Word’s functionality. That’s not to say the other 90% of the capability in Word isn’t great, it’s just most people don’t need it. Perhaps then you’d assume bespoke is the way forward, but wouldn’t you rather have Microsoft Word and not use 90% of it, than have to have your own equivalent built from scratch? 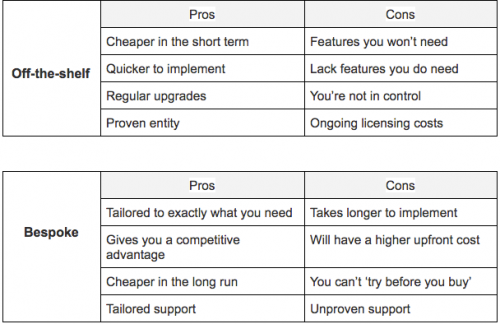 Ultimately you should always carefully consider both options before reaching a decision, so here’s our list of pros and cons for both options. Remember, there is no right or wrong when choosing between off-the-shelf and bespoke systems. Where the ‘right’ or ‘wrong’ comes into play, is in the decision-making process. If you’ve done the proper due diligence, mapped out requirements, gained expert opinions and properly compared all the options, then whichever system you choose will be the right choice. The wrong choice only comes from failing to do the above. Are you looking to implement a database? We can help answer some of your questions, just send us a message.